The Pardalotes are a small Australasian family composed of just four species in the genus Pardalotus. In size and shape they might remind American observers of small, colorful nuthatches (e.g., they frequently hang upside down when foraging), but they are not restricted to tree trunks or cones in their foraging, but glean throughout the foliage. All species are colorful, active, and have short black bills. Many feed on the sugary lumps exuded by psyllids (small plant-sucking insects living on Eucalyptus trees). Simpson & Day (1996) say that the "clicking sounds made by the bills of these birds when removing lerps is a characteristic of their feeding." Except when breeding, pardalotes are generally feeding high up in Eucalyptus, making them difficult to observe. Several species are migratory and make substantial seasonal movements. The Striated Pardalote (left or above in a nice shot by Ed Harper) comes in a variety of fairly distinctive plumages across a broad geographic range, and has been split by some into as many as four or five species. 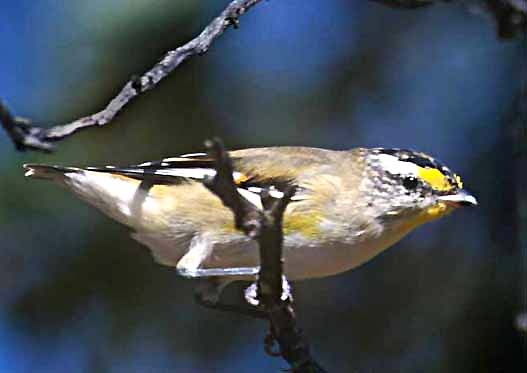 The one shown here is the nominate race P. s. striatus, the "Yellow-tipped Pardalote" that breeds in Tasmania and is migratory widely throughout southeast Australia. Most of the population leaves Tasmania in the fall and winters as far north as Queensland. Some mainland breeding subspecies are black-headed, but all have the broad bicolored supercilium: yellow distally and white behind. 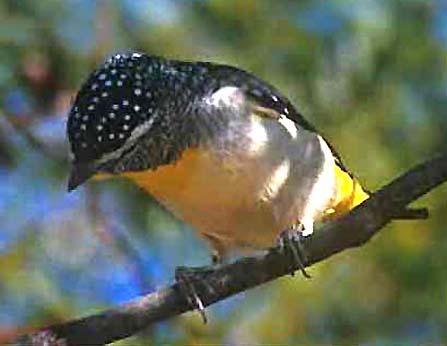 The Spotted Pardalote (right, in another Ed Harper photograph) is a widespread breeder throughout mainland Australia. It, too, is variable with a red-rumped form in wetter habitat and a dry-country yellow-rumped form that used to be considered a separate species ("Yellow-rumped Pardalote P. xanthopygus"). To many observers, pardalotes are most noticeable when breeding in the ground. The Spotted Pardalote uses a tunnel built in clay or soil that ends in a lined chamber, and may ignore the approach of birders. These nest holes are widely spaced since pairs defend the site from other birds. In contrast, Striated and Forty-spotted Pardalote P. quadragintus (a Tasmanian endemic) breed primarily in loose colonies, using various hollows in trees or in earthen banks. The Forty-spotted seems only to be successful in such small colonies (Blakers et al. 1984, Simpson & Day 1996). The final species is the Red-browed Pardalote P. rubricatus of dry woodlands of northern Australia. It is nomadic in its movements, and is decidedly more common in the western portions of its range (Schodde & Mason 1999, Morcombe 2000). It has a larger bill than the pardalotes shown in these photos, and adults are pale-eyed. Pardalotes were once placed with flowerpeckers in the Dicaeidae, but Sibley & Ahlquist (1990) and Sibley (1996) showed that this small group of birds is one of the great corvid assemblage that arose in Australasia. Biochemical analysis shows that they are most closely related to scrubwrens, thornbills, bristlebirds and allies; indeed, Sibley & Ahlquist (1990) and Sibley (1996), followed by Simpson & Day (1996), place all these groups together under a much broadened Pardalotidae. The more conservative approach (which I follow here, and which is the apparent approach of the Handbook of the Birds of the World series) is to place the pardalotes in their own family and group together the scrubwrens, thornbills, etc., in their own family, the Acanthizidae [Australo-Papuan Warblers]. Photos: The Striated Pardalote Pardalotus striatus and the Spotted Pardalote Pardalotus punctatus photos were taken by W. Ed Harper during a 1998 trip to Australia, and presumably these shots were taken mostly in southern or southeastern Australia. Photos © 2003 W. Ed Harper, used with permission; all rights reserved. There is no family book as yet, and the Handbook of the Birds of the World has not yet reached this group, but the Australian literature that includes this family is reasonably extensive (e.g., Blakers et al. 19984, Schodde & Mason 1999, Simpson & Day 1996. Morcombe 2000). Morcombe, M. 2000. Field Guide of Australian Birds. Steve Parish Publ., Archerfield, Australia. Schodde, R., and I.J. Mason. 1999. The Directory of Australian Birds, Passerines. CSIRO Publishing. Sibley, C. G. 1996. Birds of the World, on diskette, Windows version 2.0. Charles G. Sibley, Santa Rosa, CA.